Grits: You love them or you hate them. There is NO in between. I will admit this--most of the southern population has been eating mediocre grits their whole lives. Boiled in a pot with water for just a few minutes, the texture is akin to Quikrete. No wonder Notherners think we're crazy down here. A true grit lover scoffs at instant or quick-cooking grits; only long-cooking stone-ground grits are worth eating. Grits are served as a side dish for breakfast and in recent times, for dinner and are traditionally doctored up with butter, milk, cream and sometimes sugar. 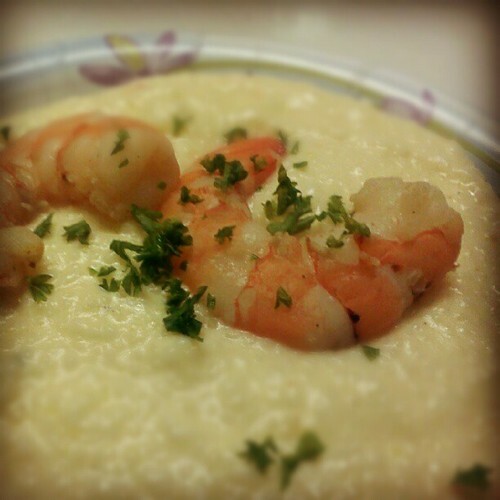 The ubiquitous Southern staple: Shrimp and grits. Bring milk and butter to a slow boil. Stir in grits with a whisk. Reduce the heat to the low and cook the grits until all the liquid is absorbed, about 20 to 25 minutes. The grits should have the same consistency as oatmeal (moist, not dry). If the grits become too thick, add water to thin. Remove from the heat and stir in the cheese. Keep covered until ready to serve. Rinse the shrimp and pat dry. Fry the bacon in a large skillet until browned and crisp, then drain on a paper towel. Add mushrooms, the lemon juice, half-and-half, parsley, green onions, and garlic. Cook for 5 minutes or just until mushrooms release their moisture. Next, add the shrimp and until shrimp turn pink. Remove the skillet from the heat. Pour the grits into a serving dish. Pour the shrimp mixture over the grits. Garnish with the bacon bits.